- CHIKARA Cibernetico & Robin (September 22, '07) = The Osirian Portal (Amasis & Ophidian) defeated ShaneSaw. - CHIKARA Bruised (October 26, '07) = The Ophidian Portal fell to Up In Smoke. - CHIKARA New Star Navigation (October 27, '07) = The Orisian Portal lost to the CHIKARA Campeonatos de Parejas Champions, Incoherence. - CHIKARA Battle Of Who Could Care Less (November 16, '07) = The Osirian Portal & F.I.S.T. (Gran Akuma & Icarus) were beaten by Mike Quackenbush & The Colony (Fire Ant, Soldier Ant, & Worker Ant). - CHIKARA The Sordid Perils Of Everyday Existence (November 17, '07) = The Osirian Portal took down Lince Dorado & Pantera. - CHIKARA Chapter 11 (November 18, '07) = The Osirian Portal & Shayne Hawke fell to Trik Davis, Mike Quackenbush, & Helios. - CHIKARA Stephen Colbert > Bill O'Reilly (December 9, '07) = The Osirian Portal defeated Los Ice Creams. - CHIKARA King of Trios Tournament '08, Night One (February 29, '08) = Team Egypt (The Osirian Portal & Mecha Mummy) lost in the opening round of the King of Trios Tournament to Mike Quackenbush, Jorge Rivera, & Shane Storm. Los Luchadores (Lince Dorado, Incognito, & Pantera) won the tournament. - CHIKARA King of Trios Tournament '08, Night Three (March 2, '08) = In a non-tournament match, The Osirian Portal & Los Ice Creams lost a "Relevos Atomicos" Match to Arik Cannon, Tim Donst, Chiva II, & Create-A-Wrestler. - CHIKARA Deuces Wild (April 19, '08) = The Osirian Portal defeated The Colony (Fire Ant & Soldier Ant). - CHIKARA Grit And Glory (May 18, '08) = The Osirian Portal lost to the CHIKARA Campeonatos de Parejas Champs, Incoherence. - CHIKARA Aniversarioma! (May 23, '08) = The Osirian Portal took down 2.0. - CHIKARA Aniversarioct! (Super No Vacancy) (May 24, '08) = The Osirian Portal lost to Mike Quackenbush & Shane Storm. - CZW Respect Is Earned II (June 7, '08) = In a dark match, The Osirian Portal fell to Mitch Franklin & Shane Hagadorn. - CHIKARA Young Lion's Cup VI, Night Three (June 15, '08) = In a non-tournament match, The Osirian Portal fell to Sweet 'n' Sour Inc (Sara Del Ray & Bobby Dempsey). - CHIKARA Tragedy And Triumph (July 13, '08) = The Osirian Portal & F.I.S.T. (Gran Akuma & Icarus) won over The Colony (Soldier Ant & Worker Ant) & The Super Smash Brothers. - CHIKARA All That Glitters (August 9, '08) = The Osirian Portal were beaten by The Super Smash Brothers. - CHIKARA Vanity And Violence (August 10, '08) = The Osirian Portal & Brodie Lee fell to Claudio Castagnoli & Incoherence. - CHIKARA La Loteria Letal (September 6, '08) = In a non-tournament match, The Osirian Portal & F.I.S.T. (Gran Akuma & Chuck Taylor) lost to Hallowicked & The Colony (Fire Ant, Soldier Ant, & Worker Ant). - CHIKARA Style And Substance (September 7, '08) = The Osirian Portal won a "Tag World Grand Prix '08 Qualifier" Match over Up In Smoke. - CHIKARA Laying In The Gutter, Looking At The Stars (September 21, '08) = The Osirian Portal took down Da Soul Touchaz (Acid Jaz & Marshe Rockett). - CHIKARA The Global Gauntlet, Night One (October 18, '08) = The Osirian Portal defeated Shinya Ishikawa & Atsushi Ohashi. - CHIKARA The Global Gauntlet, Night Two (October 19, '08) = The Osirian Portal won the CHIKARA Campeonatos de Parejas Titles, winning a "Three Falls" Match over The Super Smash Brothers. - RoH Ring of Homicide 2 (October 25, '08) = The Osirian Portal lost to the RoH World Tag-Team Champions, Kevin Steen & El Generico. - CHIKARA Tag World Grand Prix '08, Night One (November 8) = The Osirian Portal beat The Thrillers (Wade Fitzgerald & Joel Redman) in the first round of the Tag World Grand Prix Tournament. - CHIKARA Tag World Grand Prix '08, Night Two (November 9) = The Osirian Portal defeated Tommy End & Andrew Patterson, then lost in the finals of the Tag World Grand Prix, losing a "Three Way" Match to The Colony (Fire Ant & Soldier Ant). Martin Stone & PAC were the other participants. - CHIKARA Cibernetico Begins (November 15, '08) = The Osirian Portal competed in the "Torneo Cibernetico" Match, which was won by Equinox. - CHIKARA Armdrags To Riches (November 16, '08) = The Osirian Portal (Escorpion Egipico [subbing for Amasis] & Ophidian) defended the CHIKARA Campeonatos de Parejas Titles, winning a "Three Falls" Match over Lince Dorado & Equinox. - CHIKARA Duel And Duality (December 14, '08) = The Osirian Portal (Escorpion Egipico & Ophidian) took down The Super Smash Brothers. - CHIKARA Revelation X (January 25, '09) = The Osirian Portal (Amasis & Ophidian) retained the CHIKARA Campeonatos de Parejas Titles, beating The Colony (Fire Ant & Soldier Ant). - CHIKARA If The Airplane Is Snowed In, Put Your Bloody Skis On And Get Going! (February 20, '09) = The Osirian Portal (Amasis & Ophidian) took down Lince Dorado & Jimmy Olsen. - CHIKARA King of Trios Tournament '09, Night One (March 27) = The Osirian Portal (Amasis, Ophidian, & Escorpion Egipico) defeated Team PWG (El Generico & The Young Bucks) in the opening round of the King of Trios Tournament. - CHIKARA King of Trios Tournament '09, Night Two (March 28) = The Osirian Portal (Amasis, Ophidian, & Escorpion Egipico) fell to The Future Is Now (Lince Dorado, Equinox, & Helios) in the quarter-finals of the King of Trios Tournament. F.I.S.T. (Gran Akuma, Chuck Taylor, & Icarus) won the tournament. - CHIKARA King of Trios Tournament '09, Night Three (March 29) = In a non-tournament match, The Osirian Portal (Amasis & Ophidian) & Team DDT (Michael Nakazawa & KUDO) beat The Colony (Fire Ant & Soldier Ant) & The North Star Express. - CHIKARA Behind The Eight Ball (April 25, '09) = The Osirian Portal (Amasis & Ophidian) kept the CHIKARA Campeonatos de Parejas Titles, winning over Mike Quackenbush & Jigsaw. 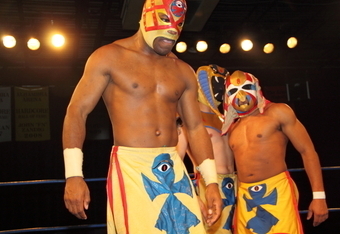 - CHIKARA The Bobliographon (April 26, '09) = The Osirian Portal (Amasis, Ophidian, & Escorpion Egipico) lost to The Future Is Now (Lince Dorado, Equinox, & Helios). - CHIKARA Aniversario Yin (May 23, '09) = The Osirian Portal (Amasis & Ophidian) & Los Ice Creams fell to The Colony (Fire Ant & Soldier Ant) & The Super Smash Brothers. - CHIKARA Man Makes Plans, And God Laughs (September 12, '09) = The Osirian Portal were beaten by F.I.S.T. (Chuck Taylor & Icarus). - CHIKARA Hiding In Plain Sight (September 13, '09) = The Osirian Portal lost the CHIKARA Campeonatos de Parejas Titles to The Colony (Fire Ant & Soldier Ant). - CHIKARA An Optimistic View Of a Pessimistic World (October 17, '09) = The Osirian Portal won a "Four Way Tag-Team" Match over F.I.S.T. (Chuck Taylor & Icarus), The Throwbacks, and The Young Bucks. - CHIKARA Cibernetico Increible (October 18, '09) = The Osirian Portal defeated The Roughnecks. - CHIKARA Three-Fisted Tales (November 22, '09) = The Osirian Portal lost to the CHIKARA Campeonatos de Parejas Champions, falling to The Colony (Fire Ant & Soldier Ant). - CHIKARA A Touch Of Class (January 31, '10) = The Osirian Portal fell to The BDK (Sara Del Ray & Daizee Haze). - CHIKARA The Mint Condition (February 27, '10) = The Osirian Portal & Incoherence defeated The Badd Boys & F.I.S.T. (Gran Akuma & Icarus). - CHIKARA A World Of Comforting Illusions (February 28, '10) = The Osirian Portal lost a "Four Way Tag-Team Elimination" Match to The BDK (Swiss Money Holding). The Badd Boys and The Super Smash Brothers were the other participants. - CHIKARA Wit, Verve, And A Bit o' Nerve (March 20, '10) = The Osirian Portal took down The UnStable (Vin Gerard & STIGMA). - CHIKARA Dead Men Don't Laugh (March 21, '10) = The Osirian Portal fell to F.I.S.T. (Gran Akuma & Icarus). - CHIKARA King of Trios '10, Night One (April 23) = The Osirian Portal & Sara Del Ray lost in the opening round of the King of Trios Tournament to the eventual winners, The BDK (Tursas & Swiss Money Holding). - CHIKARA We Must Eat Michigan's Brains (June 26, '10) = The Osirian Portal were beaten by The BDK (Lince Dorado & Pink Ant). - CHIKARA Faded Scars And Lines (June 27, '10) = The Osirian Portal fell to The UnStable (Vin Gerard & STIGMA). - CHIKARA Chikarasaurus Rex: King Of Show (July 25, '10) = The Osirian Portal & Drake Younger took down The UnStable (Colin Delaney, Vin Gerard, & STIGMA). - CZW A Tangled Web III (August 14, '10) = The Osirian Portal won a "CZW World Tag-Team Title Tournament" Match over The Best Around. - CHIKARA Young Lions Cup VIII, Night Three (August 29, '10) = The Osirian Portal competed in "The Countdown Showdown", which was won by Johnny Gargano. - CHIKARA Eye To Eye (September 18, '10) = The Osirian Portal won an "Elimination" Match over The Batiri (Kodama & Obariyon), Incoherence, and The UnStable (Vin Gerard & STIGMA). - CHIKARA Through Savage Progress Cuts The Jungle Line (September 19, '10) = The Osirian Portal defeated The BDK (Daizee Haze & Delirious). - CZW Deja Vu 5 (October 16, '10) = The Osirian Portal fought to a 15-Minute Draw with Irish Driveby. - CHIKARA Terror In The Neighborhood (October 24, '10) = The Osirian Portal lost a "Three Falls" Match to the CHIKARA Campeonatos de Parejas Champs, The BDK (Swiss Money Holding). - CZW Night of Infamy 9: Betrayal (November 13, '10) = The Osirian Portal won a "CZW World Tag-Team Titles Tournament Semi-Finals" Match over The Runaways. - CHIKARA Scornucopia (November 20, '10) = The Osirian Portal fell to The Batiri (Kodama & Obariyon). - CHIKARA The Germans (November 21, '10) = The Osirian Portal lost a "Four Way Tag-Team Elimination" Match to Mike Quackenbush & Jigsaw. F.I.S.T. (Gran Akuma & Icarus) and The BDK (Sara Del Ray & Daizee Haze) were the other participants. - CZW Cage of Death XII (December 11, '10) = The Osirian Portal lost to Philly's Most Wanted, who won the vacated CZW World Tag-Team Titles. - CHIKARA Reality Is Relative (December 12, '10) = The Osirian Portal & Jonathan Gresham took down The BDK (Lince Dorado, Pink Ant, & Delirious). - CHIKARA Chaos In The Sea Of Lost Souls (January 23, '11) = The Osirian Portal (Amasis, Hieracon, & Ophidian) defeated F.I.S.T. (Johnny Gargano, Chuck Taylor, & Icarus). - CHIKARA Caught In A Cauldron Of Hate (February 19, '11) = The Osirian Portal (Amasis, Hieracon, & Ophidian) won over The Colony (Fire Ant, Green Ant, & Soldier Ant). - CHIKARA Clutch Of Doom (February 20, '11) = The Osirian Portal (Amasis & Hieracon) won a "Four Way Tag-Team Elimination" Match over 3.0, The BDK (Daizee Haze & Delirious), and Los Ice Creams. - CHIKARA Operation Big Freeze (March 12, '11) = The Osirian Portal (Amasis, Hieracon, & Ophidian) won, via DQ, over Sinn Bodhi & The Batiri (Kodama & Obariyon). - CHIKARA Creatures From The Tar Swamp (March 13, '11) = The Osirian Portal (Amasis, Hieracon, & Ophidian) defeated The BDK (Tim Donst, Pinkie Sanchez, & Tursas). - CHIKARA King of Trios '11, Night One (April 15) = The Osirian Portal (Amasis, Hieracon, & Ophidian) took down �3.0l�! (El Generico & 3.0) in the opening round of the King of Trios Tournament. - CHIKARA King of Trios '11, Night Two (April 16) = The Osirian Portal (Amasis, Hieracon, & Ophidian) defeated Team Dragon Gate (Super Shisa, Akira Tozawa, & KAGETORA) in the quarter-finals of the King of Trios Tournament. - CHIKARA King of Trios '11, Night Three (April 17) = The Osirian Portal (Amasis, Hieracon, & Ophidian) lost in the semi-finals of the King of Trios Tournament to the eventual winners, The Colony (Fire Ant, Green Ant, & Soldier Ant).